Federal drug cops in the United States are conducting electronic eavesdropping three times as often as they were nearly a decade ago, new records reveal. US Drug Enforcement Agency data obtained by USA Today show that the number of annual requests filed for wiretaps and other sort of electronic eavesdropping went from 3,394 in 2005 to 11,681 during the last fiscal year. According to the newspaper, which first reported the revelations on Wednesday after obtaining statistics through Freedom of Information Act requests, that surge in surveillance occurred largely without oversight. Most of the requests were “never reviewed by federal judges or Justice Department lawyers,” USA Today reported. Instead, DEA agents are bypassing the DoJ and taking their requests to local prosecutors and judge across the country around 60 percent of the time. Federal law requires top DoJ officials to sign off on any potential wiretaps, but a loophole allows for federal agents to file those same requests with state courts –where those restrictions don’t exist. Prosecutors are still required to demonstrate probable cause, but USA Today reporter Brad Heath wrote that interpretations vary from jurisdiction to jurisdiction. "Within Justice, it was a rigorous standard," former DoJ attorney Stephen T'Kach told Heath. "In the states, you have 50 different standards for what's going to be enough." "That law exists to make sure that wiretap authority is not abused, that it's only used when totally appropriate," added Hanni Fakhoury, an attorney with the Electronic Frontier Foundation digital rights group. "That's a burden. And if there's a way to get around that burden, the agents are going to try to get around it." 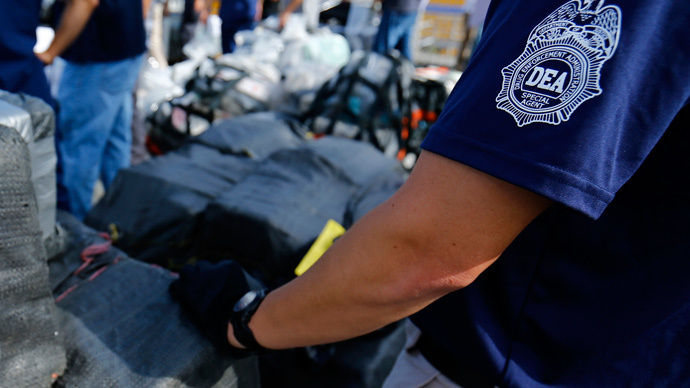 According to Joseph Moses, a DEA spokesperson, the uptick in requests reflects "the proliferation of communication devices and methods" used by the drug traffickers. Indeed, other reports in recent months suggest that drug cops have embraced an array of state-of-the-art surveillance tools to give the DEA the ability to cast a digital fishing net unmatched by most other government agencies: Earlier this year it was revealed that the DEA has spent over $2 million on sophisticated surveillance equipment. Those digital tools were purchased through a front company secretly acting on behalf of “Hacking Team,” an Italian vendor of spy tools. Weeks earlier, USA Today reported that the DEA began running a telephone surveillance program in the early 1990s that was not unlike the National Security Agency operation instituted after the September 11, 2001 terrorist attacks and reined in only this week.